What Style of Wedding Dress is Best for Outdoor Weddings? Outdoor weddings become more and more popular. No one will deny that it’s extremely romantic to get married, having nature as the background. 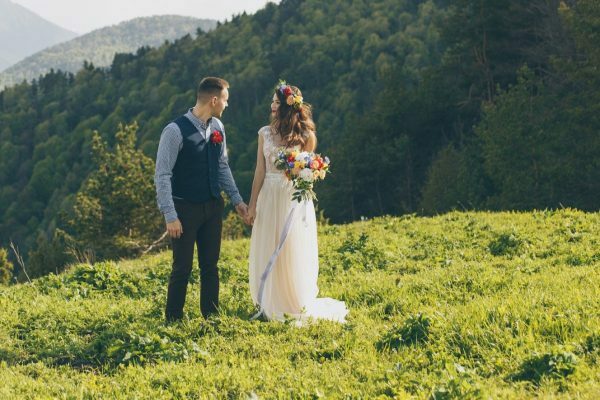 Beach, country and simple backyard ceremonies are chosen by many modern brides and so, we’d like to share our thoughts on what style of wedding dress is best for outdoor weddings. So, let’s start and see what the best wedding dresses for outdoor weddings are. Beach wedding dresses can be used not only for beach wedding ceremonies, but for other wedding types as well, including country and backyard weddings. This type of wedding dress is usually characterized by light and flowing materials, minimal decoration and simple shapes. Due to their lightness and convenience, beach wedding gowns are great for any type of outdoor wedding. They come in various silhouettes and each bride can find the one which suits her body type best. The styles come in Sheath, Mermaid and Greek. Casual wedding dresses are often chosen by girls, who don’t plan a luxurious wedding ceremony and plan to have a ceremony in the family circle in the backyard. Another reason for such a choice is the price. It’s not a secret that casual dresses are much more affordable than traditional wedding gowns. However, don’t think that all simple and cheap wedding dresses look awful. You can find really cool and stylish variants, which will suit your outdoor wedding ceremony and will make you a very beautiful bride. Almost every simple dress can be complemented with accessories to embellish it. Bohemian style dresses are something unforgettable. These gowns look creative and unique, remaining, at the same time, rather simple. 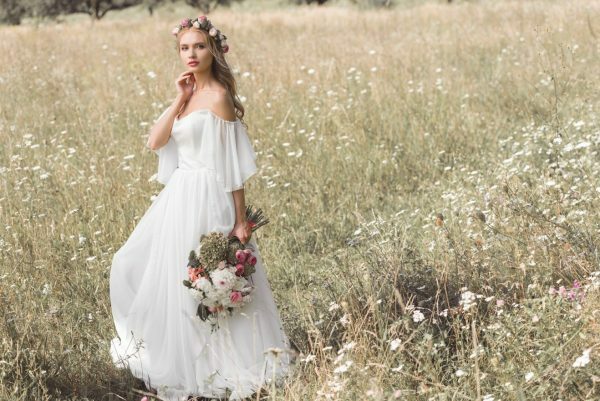 That mix of luxury and simplicity make bohemian dresses a cool option for various wedding formats, including outdoor weddings. As a rule, bohemian wedding dresses are simple in their form and are often of a sheath or empire waist silhouette. The most important is the dress details. An empire waist, chiffon wedding gown may feature intricate beading on the bodice. Or, a lace wedding dress in sheath silhouette may have cute bishop sleeves. A wedding dress for a country wedding is usually simple and easy to wear. It doesn’t feature too much embellishment like beading and crystals. However, it can be made of various materials, including lace, chiffon, silk, satin and tulle. The silhouettes are usually A-line, sheath and empire waist. Though country wedding gowns aren’t usually richly embellished, they may have some other accents. For instance, a dress may have off the shoulder neckline and feature a big ruffle. Also, a wedding gown may have slits or be of unusual lengths like high-low or tea-length. Not every bride will risk wearing a short dress for her wedding. Despite that, short wedding dresses are becoming more and more popular every season. They are very convenient for outdoor weddings. A cute alternative is to have a transformer wedding dress. You may have a short dress, but wear it with a long skirt. After the ceremony, you may take the skirt off and wear a short dress for the reception. When choosing your wedding dress, you don’t need to follow any rules strictly. Besides suiting the wedding location, the dress must be flattering for your body and highlight your beauty. Of course, you need to like it as well. Our list doesn’t feature all kinds of wedding dresses. It is your day if you want to look like a princess in a ball gown style at your outdoor wedding, then, by all means, do so.